Leslie Nicole Edgin and Jack Cuneo Haight were married, Sunday, Dec. 17, 2017, at 4 o’clock in the afternoon at the Springs Lodge in Aubrey, Texas. The bride is the daughter of Jack and Lora Edgin of Frisco, Texas, and the granddaughter of Eldon and Janice Edgin of Dallas and Pero and Dorothy Scallion of Campti. The groom is the son of Dr. Fred and Alicia Haight of Melissa, Texas, and the grandson of Jim and Martha Sullivan of Melissa and Bill and Diane Haight of Sherman, Texas. Dr. Fred Haight, the groom’s father, officiated at the nuptials. Presented in marriage by her parents and escorted by her father, the bride wore a white Oleg Cassini full length, off-the-neck lace A-line dress covered with imported, ornate applique packets inspired by royal motifs. It was crafted with three types of lace and 2,000 beads and sequins with long delicate lace sleeves. Her floor length veil was edged with lace, beads and sequins as well. The bride’s bouquet consisted of a cascade of burgundy roses and blue thistle surrounded by greenery. The bride’s seven attendants, Maids of Honor Stephanee Smith and Bete Workye and bridesmaids, Chloe Coles, Cassidy Pinchard, Kelsey Ryan, Abigail Haight and Becky Pfeiffer accompanied the bride wearing full-length sleeveless wine-colored dresses with floral lace neck-high bodices, dainty ribbon waists and a knee-high split in the front skirt. The bridesmaids’ smaller bouquets echoed the bride’s. The groom and his attendants wore navy tuxedoes. The best men were Joey Gilbreath and Alex de la Pena. Other groomsmen were Willie Haight, Peter Haight, Ben Edgin, Jordan Pinchard, Tommy Faybian and Logan Igarta. After a reception at the Springs Lodge, the couple spent their honeymoon on a cruise to Cancun, Mexico. The bride, an honor graduate of Lone Star High School in Frisco, is a senior at Texas Woman’s University in Denton, Texas, majoring in Kinesiology. 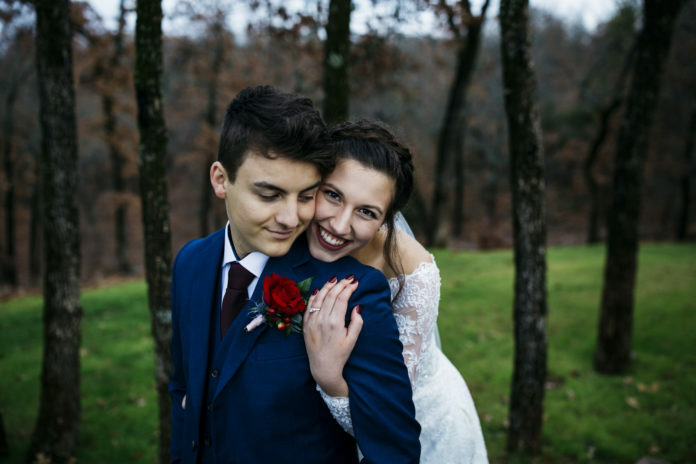 The groom, who was home-schooled by his mother, Alicia, is a junior at the University of North Texas in Denton, Texas, majoring in history. After returning from their wedding trip, the couple will live in Denton, where they will continue their studies.